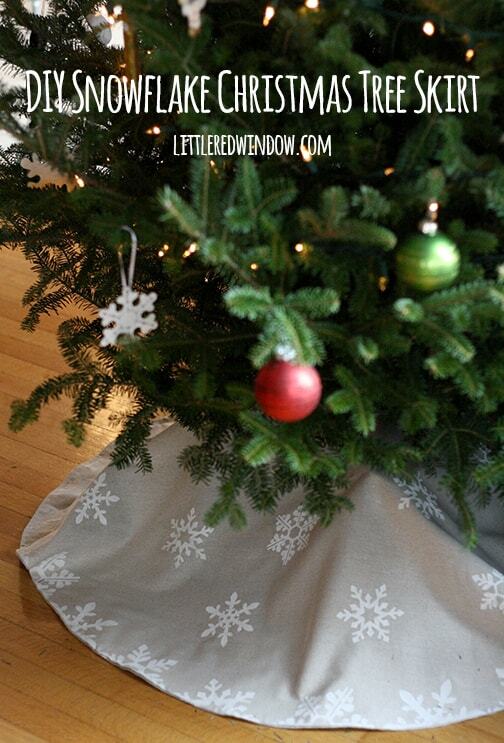 Make your own cute, stenciled Snowflake Christmas Tree Skirt with this tutorial! This year we got our very first real Christmas tree! My parents always always had a real tree growing up, often one we went and cut down ourselves. In fact, there was one year when we drove up to see my grandparents, the ones who lived about two hours north, trooped out into an actual forest, cut our tree, dragged it out of the woods on a sled, tied it to the top of the car and drove it home. And then, as my parents tell it, and they can never do so without laughing, when we got home, every. single. needle was gone. Note to self, trees don’t hold up to highway winds! Aa and I have had a fake tree for almost ten years. We bought it for our first apartment and it was really starting to look pretty sad. I actually really like the convenience and the cost savings every year. You do miss the smell, but there aren’t needles all over the floor all the time so that’s a plus. So believe it or not, even though we’ve moved into a house, I was still kind of on the fence for real vs. fake. On the fence, that is, until they opened a Christmas tree lot literally two doors down from our front door. Honestly, our neighborhood just keeps getting more and more convenient. It’s kind of ridiculous. After walking past the trees for a couple days before they started selling them and smelling the amazing pine smell, I was sold. So we walked over with O, picked one out and the nice guy working there picked it up carried it home and actually brought it inside and put it in the stand for us! The whole thing took less than 10 minutes! There was even a tree stand the previous owners left under the porch. Perfect! 1. I laid my back fabric down on the floor, right side UP. Then I laid my front fabric on top, right side DOWN. To find the center of the fabric. 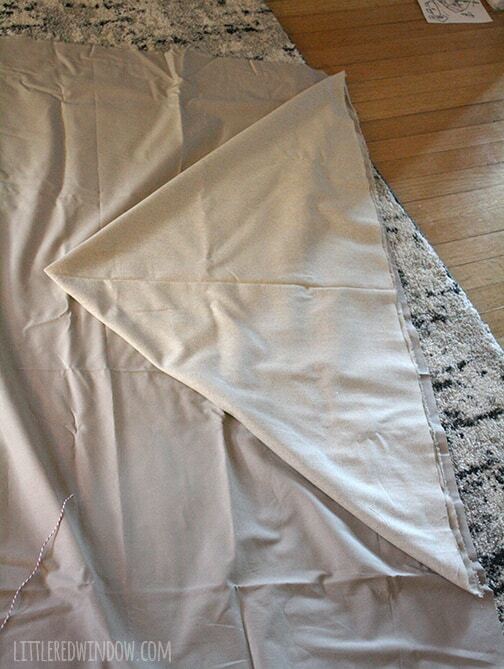 I first folded it diagonally from edge to edge, this created a square as wide as the fabric is in both directions. 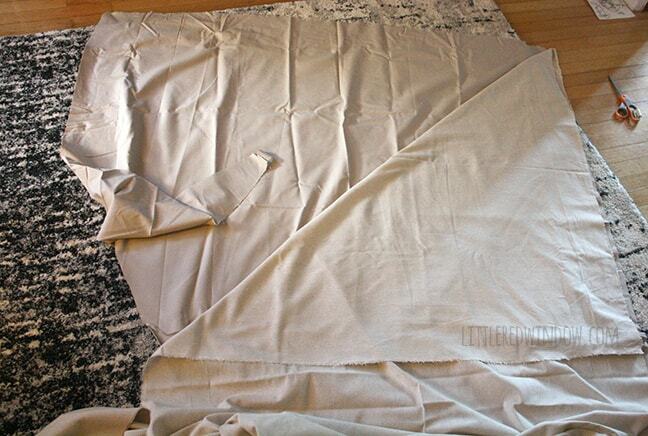 In my case it was standard 45″ fabric so I ended up with a 45″ square. 2. Next, I folded the triangle diagonally one more time. The point on the left is now the center of that 45″ square! I marked that with a fabric pen. 4. Draw a smaller circle around the same center point for the tree trunk. Mine had a radius of about 8 inches. 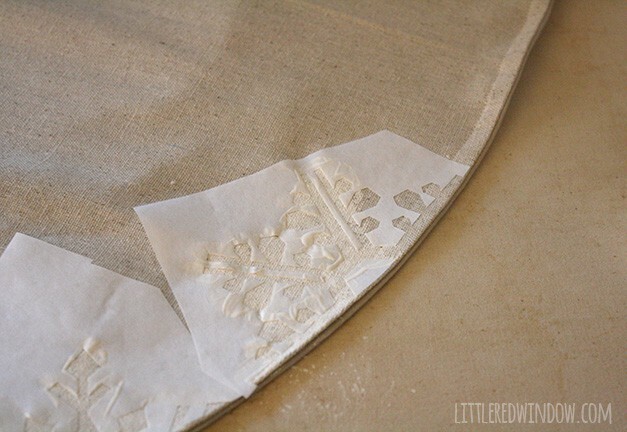 Next, I smoothed both layers of fabric out and pinned them together near the cut lines. 5. 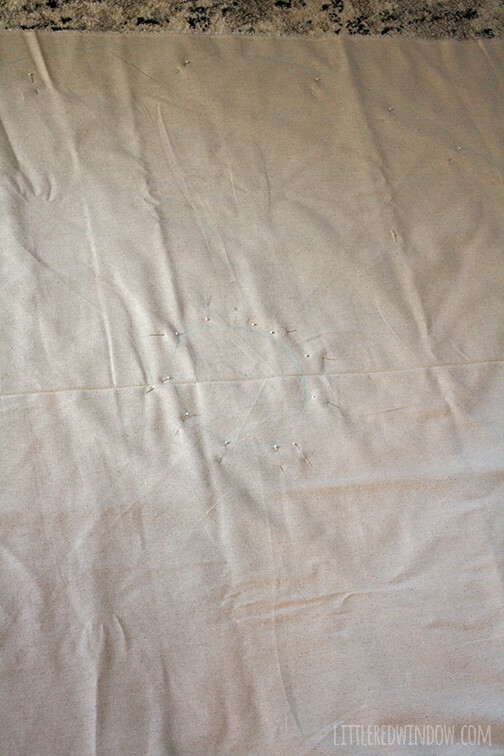 Then I cut through both layers of fabric along both cut lines so it looked like a doughnut. Then I cut through one side of the doughnut. This is how you get it around the tree. 6. I wanted a way to secure the tree skirt so I cut a long strip of velcro. And instead of separating the front and back fabrics and then trying to line them up again later, I just opened them up along the straight cut edge. Remember the right sides of your fabrics are INSIDE right now. Pin one piece of the velcro inside on the front fabric (top in the photo) and pin the other, on the other side on the back fabric (bottom in the photo) like I’ve shown in the picture. Then stitch around the edges of the velcro to secure it but be sure to ONLY sew it to either the front or back piece of fabric that you pinned it to. Do not sew it to both layers! 7. Now close back up those straight edges so the velcro is inside. 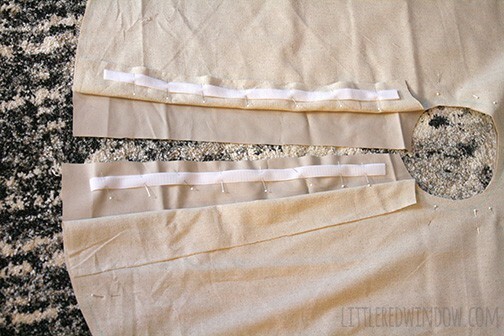 Now sew all the way around all of the edges of the doughnut shape including along the straight edges with a 1/2″ seam. Make sure to leave a 6″-8″ opening along one side of the straight edge so you can turn it right side out. 8. Clip around the curves being careful not to clip your stitches and then turn the tree skirt right side out. 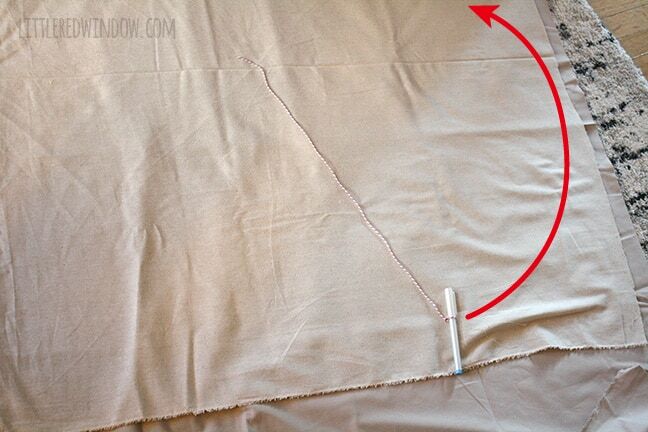 Iron it and then topstitch all the way around with a 1/4″ seam. 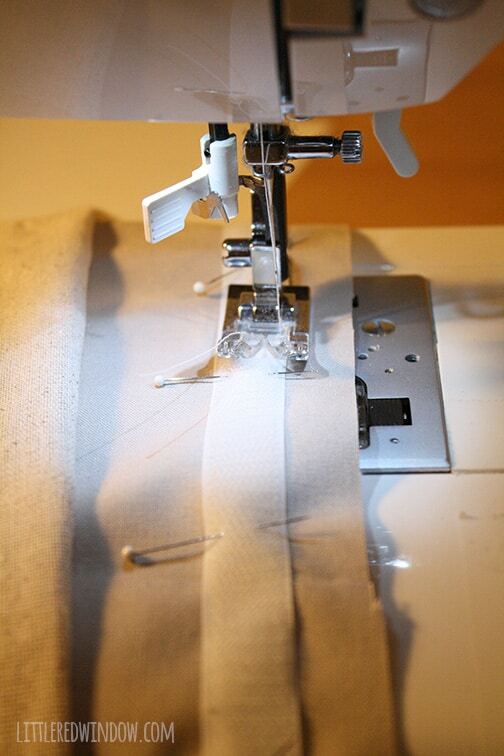 Use that topstitch to close the opening that you used for turning. 9.Now you’re ready to stencil! I loaded freezer paper into my Silhouette machine with the shiny side up on the cutting mat. I used a blade depth of 2, speed of 2 and width of 10 and that seemed to work for me. I cut out a whole bunch of snowflake shapes. 10. 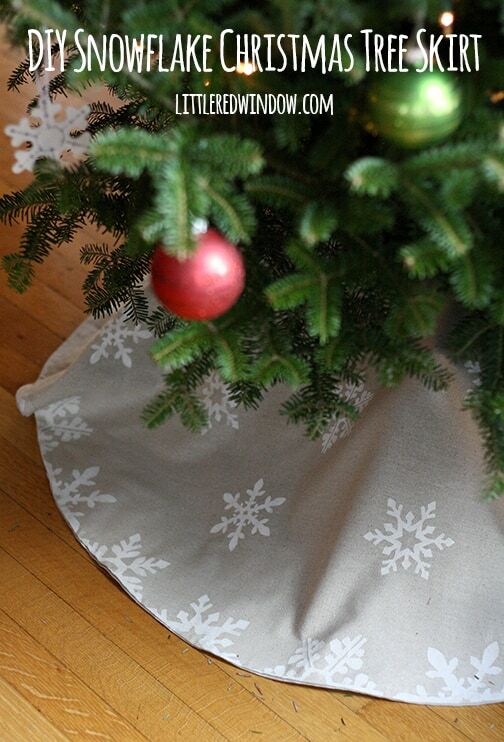 Iron your stencils to the tree skirt wherever you want them. I put a border of half snowflakes along the bottom edge and them sprinkled more snowflakes around the rest of the tree skirt. 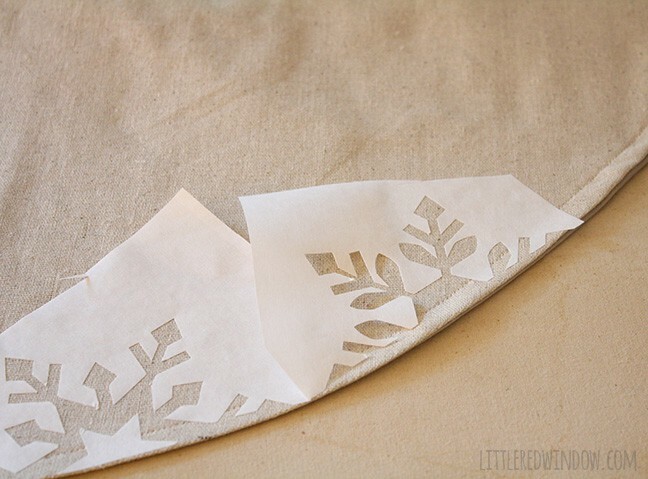 I cover freezer paper stenciling more in depth here or here if you’ve never done it before! I find it works best to peel the freezer paper off while the paint is still a little wet. 11. When the paint is dry you’re all done! Enjoy your new tree skirt! When we updated our guest bath, everything that used to be gold colored was replaced with brushed nickel. The burgundy shower curtains with gold embroidery didn’t work any more but they made a gorgeous tree skirt. 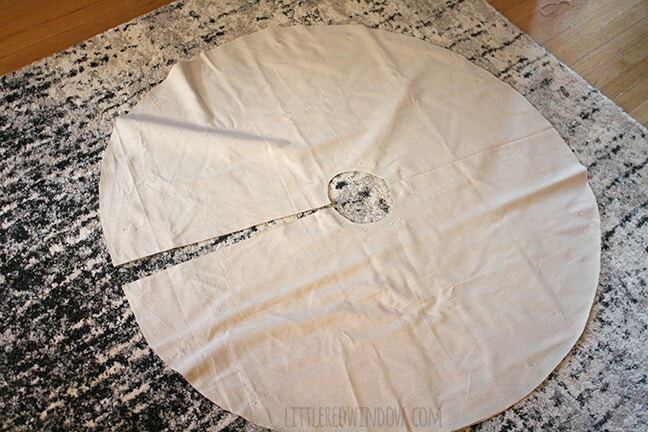 I had two, for extra fullness on the shower rod, so I had enough fabric to cut two circles and sew them together. The top piece where the shower hooks went I turned into a buttonhole placket to secure the skirt once it’s in place. Shower curtains come in very nice but still sturdy fabrics now. And, of course, washable!! The standard size is 72″ by 72″ so you get a lot of fabric for the money if you shop the sales. Cute! I’ve been meaning to make a new skirt for our tree. This one is fantastic! Forgot to say I pinned this! Thanks Theresa! (for the compliment and the pin!)xo! 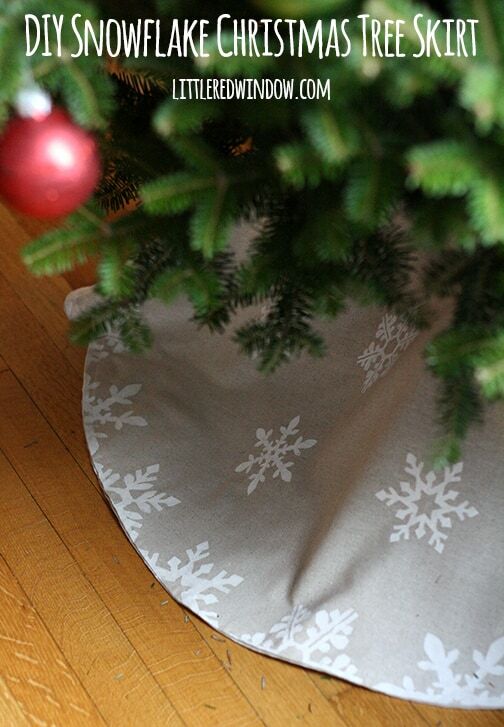 I’m normally pretty minimalist, too, so this tree skirt looks perfect to me! 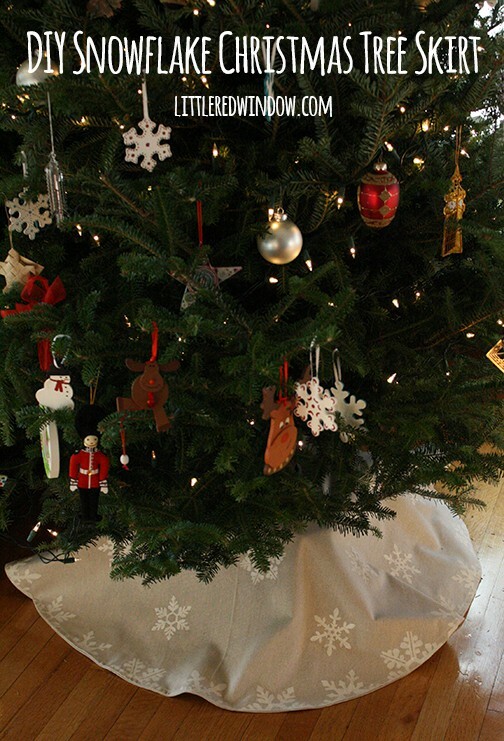 I love that it is neutral and allows whatever on the tree to shine and not compete with what is going on on the floor. 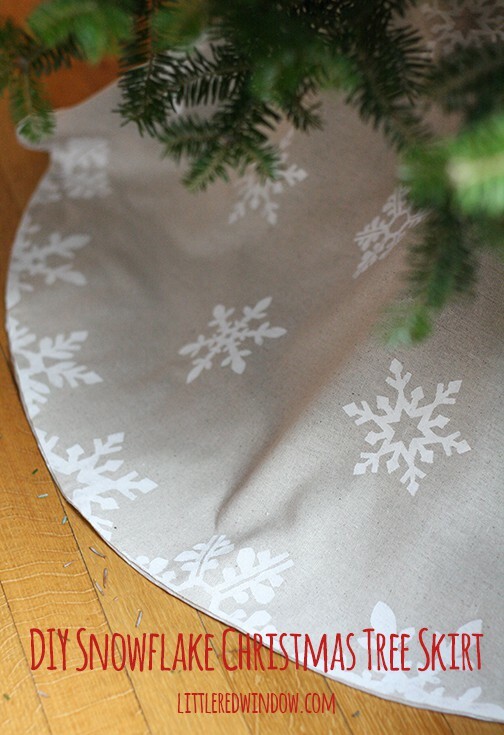 The added snowflake trim around the outside makes the tree skirt look very professional! Thanks Bre! 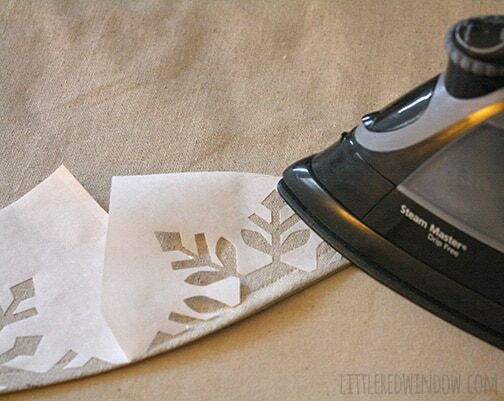 Freezer paper stenciling is the best! I’ve tried vinyl and contact paper and it never comes out as good. Good luck with your scarves, can’t wait to see them! Hi Cassie, it’s so nice to meet you and your blog! I found you over at Think and Make Thursday. 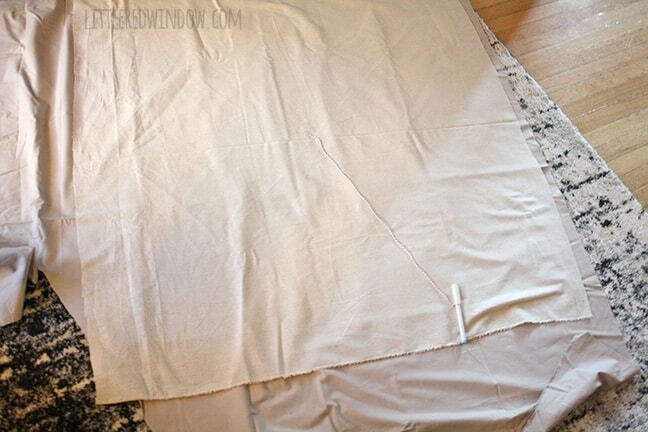 This is darling and looks easy enough for those of us who don’t normally sew. Thanks for sharing.